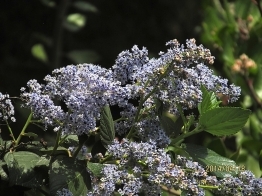 Ceanothus arboreus- is fairly tall member of the California lilac family. While the size is “variable” a good estimate is maybe 12′ x 8′ to 10′. It has medium blue fragrant flowers that bloom in spring and fall. Large dark green leaves as well. A Channel Islands native it’s the parent in many of our taller California lilac hybrids like Ceanothus ‘Ray Hartman’ for example. The flowers feed both bees and butterflies and the seeds are eaten by birds.